"Grim death dealt a cruel blow at Kemp," writes St. Francis Dam historian John Nichols (2002:37), referring to a rail siding and a temporary Southern California Edison construction camp west of Castaic Junction. 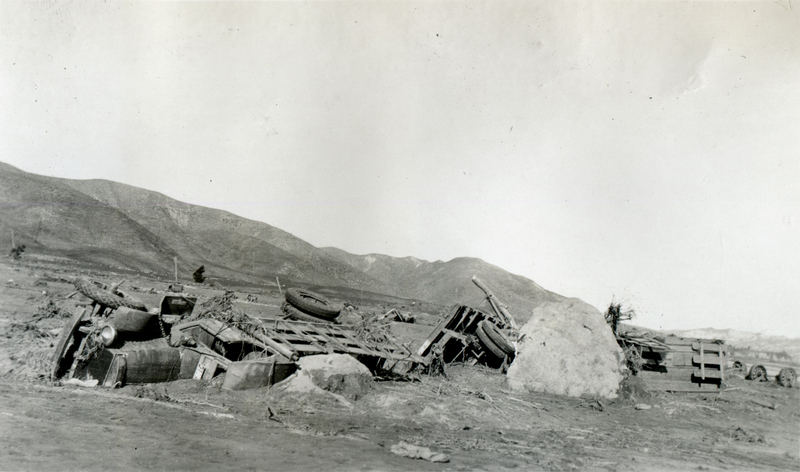 "(T)he mountain of water hit without warning" on March 13, 1928, at 1:20 a.m., about 83 minutes after the dam broke in San Francisquito Canyon. Some 150 Edison linemen had been stringing a power line from Saticoy to Saugus, Nichols writes. They were camped on the opposite bank of the dry Santa Clara River bed from Blue Cut, an outcropping of bedrock just east of the L.A.-Ventura County line. The floodwaters lashed against the rock and whipped back over the drowsy workers who'd been asleep in their tents, dealing them a double dose of disaster. Eighty-four perished, Nichols writes. "From our observations," Almer and George Newhall report on behalf their eponymous company, property owner Newhall Land, "it seem(s) to us that the terrific loss of life and damage caused to this construction camp was due to the backwash of the water when it struck the Blue Cut Promontory and was diverted first north and then southwards back across the track into the body of the stream again." "One of the witnesses told us that the water, when the flood first struck them, must have been at least 20 feet deep; in fact the water marks on a remaining telegraph pole there seem to bear out his statement," they write. The Newhalls' report is dated March 24, 1928, and accompanies photographs they shot along the flood path where it ran through their property from Saugus (Seco Canyon) to Piru. They describe how their photos "give some slight indication of the terrific force with which this backwash of the flood waters engulfed the men (at Kemp), showing respectively a freight car torn from its trucks and tipped over; a group of reels of copper cable weighing approximately 26,000 lbs. each moved from alongside of the railroad track out into the middle of the field 500 feet or more; and a close-up photograph of a few of the wrecked automobiles that belonged to the old construction gang. ... (Y)ou will notice these automobiles scattered all over the entire field and ... a steam crane being used to right some of them. "An interesting point is that while the automobile bodies, machinery and tops were very seriously damaged," they note, "we did not see a single instance where one of the tires was broken." Source: Photograph from the Edward C. Lamb collection, believed to have been created by his brother Henry C. Lamb. Henry's name alone is associated with this set of 30 St Francis Dam Disaster photos. Henry C. Lamb was a graduate of Stanford University who worked for the Edison company. His descendants report (2014) that they do not believe he was present at the Edison camp at Kemp at the time of the disaster. Although they suspect Henry shot the photgraphs himself, it is possible he received them from a third party. EJ2805: 19200 dpi jpeg from original 2.5x4-inch print. Archival scan on file.